[Update: Kohl’s has distributed new credit cards that actually work with Apple Pay]. 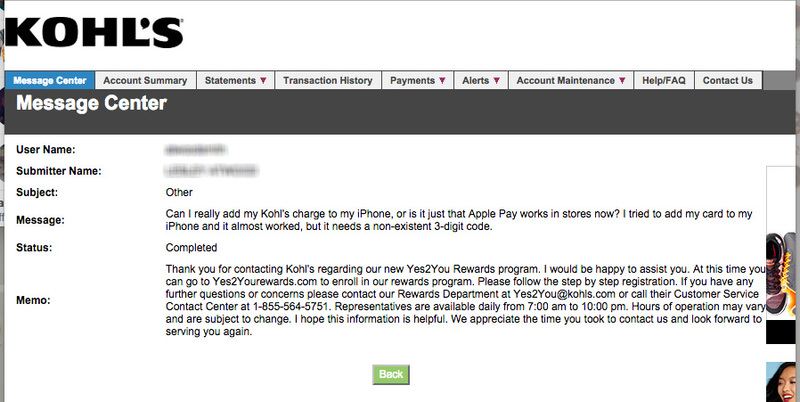 Kohl’s and Apple have been merrily posting all sorts of stuff about how Apple Pay now works with Kohl’s charge card. In my own experience, this celebration is premature. I attach my interchange with Kohl’s “secure communications” to their credit card group. This is also consistent with a telephone conversation I had with one of their customer support people: nobody at Kohl’s knows anything about Apple Pay support. I’d also like to rant pointlessly about how the so-called “customer service” people decided to give me a stock answer to a different question. Nowhere did I ask about their rewards program. Yet the answer only talks about the rewards program. Nothing about credit card problems. I suppose they use some automated thing to try to guess the right answer instead of involving humans in the tedious problem of customer support. While a human could indeed be this stupid, such stupidity leaves a trail, and such trails can end careers.